Sustainability is a concept that is put into practice at every level of the Nespoli Group. Terms such as ‘living with greater awareness’, ‘more sustainable operations’‚ ‘protect the environmental and consumer health’ and ‘using resources in a more sustainable way’ are part of our daily work mentality. But what’s really behind these magic words? In the Nespoli Group corporate philosophy sustainability is one of our the main believes and is firmly anchored in every business aspect. The roof surface of our new logistics center in Dinkelsbühl is equipped with photo-voltaic cells. We use bio-gas technology for the heating of our premises: we use approx. 200kw/h from the adjacent area and use this generated heat in all of our areas. Thanks to this, we save approx. 30% compared to heating with oil. In the production halls, we use the waste heat from the machinery. These measures make us save more than 50% on our heating/energy costs. Nespoli is well on its way to energy supplies that are both economically and ecologically sustainable. Another significant aspect is the raw material supplier selection. Nespoli Group puts a lot of efforts in finding responsible suppliers. At Nespoli product quality is not limited to legal requirements and customer satisfaction but it also means, for as far as possible, environmentally friendly and socially responsible production processes. The protection of consumers health and environmental sustainability are key drivers in our material selection. In this way we make our contribution to sustainability and lay the groundwork for a successful future of our company. The Forest Stewardship Council (FSC) is a non-for-profit international membership-based organization, supported by all the large environmental associations, that supports sustainable forest use. FSC works to take care of our forests and those who rely on them: by protecting plant and animal species, Indigenous Peoples rights, forest workers’ safety, and much more. 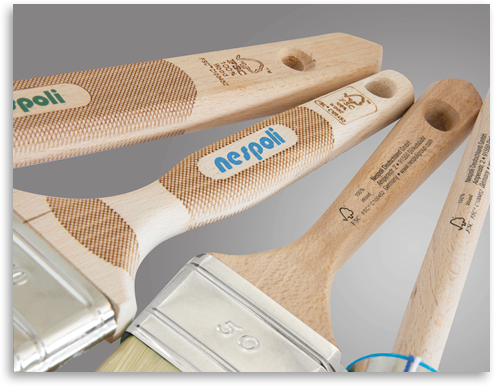 At Nespoli Group, almost all paint brushes are made from 100% FSC® certified wood. We use European beech wood that comes from sustainably-managed forests. Essentially, this means that the amount of timber that can be taken from a forest in any period can not be greater than what will grow in the equivalent time. Not only the forests benefit from FSC® certification, but also the companies that recognize the importance of responsible forest management and switch their entire range of wooden products to wood from sustainably managed forests have benefit from it. Nespoli Group is FSC® certified in all of its production sites since many years. Most of its wooden components are made of 100% FSC certified wood. The Business Social Compliance Initiative (BSCI) is a leading supply chain management system that supports companies to drive social compliance and improvements within the factories and farms in their global supply chains. BSCI implements the principle international labor standards protecting workers’ rights. It sets out 11 core labour rights, which participants and their business partners commit to implementing within their supply chains. Our production facilities in China are BSCI-audited on a yearly basis. Nespoli Group assures socially acceptable production conditions and guarantees fair employee conditions and safety in the production facilities.